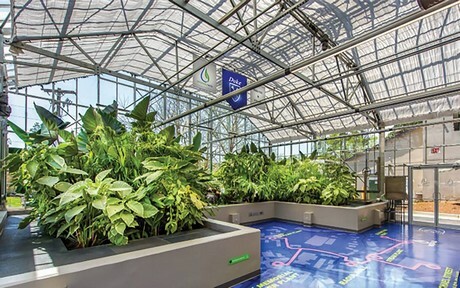 On an intellectual level, Ryan Lavinder knew when he entered the greenhouse of Emory University’s WaterHub last summer he wouldn’t smell anything. But with as much as 400 thousand gallons of sewage coursing through the facility each day, he still caught himself inhaling deep, searching for an odor. “When you walk in, you want to see if you can smell anything,” said Lavinder, who found the air in the facility odorless. Lavinder, a civil engineer with Duke Facilities Management, was part of a delegation from Duke who toured Emory’s WaterHub, a state-of-the-art, ecologically friendly on-campus water recycling system. Later this year, Duke is expected to break ground on its own WaterHub, adding another visible and functional campus feature highlighting Duke’s approach to water conservation and sustainability. “This will be a real benefit to Duke,” Lavinder said. This is an early rendering of what the interior of a WaterHub at Duke could look like. The exact design of Duke’s WaterHub has yet to be finalized. Courtesy of Duke Facilities Management. The roughly 9,000-square foot WaterHub, which will sit across Circuit Drive from Duke Pond, will intercept wastewater flowing from buildings on West Campus and cycle it through a 10-step treatment process. The reclaimed water will then be used in the nearby Chiller Plant No. 2, which drives the system that cools campus buildings. Evaporating roughly 212 million gallons of water annually in its cooling towers, the plant is the largest water-consuming entity in the city of Durham. Starting in 2021, the WaterHub will provide around 120 million gallons of reclaimed water per year for Chiller Plant No. 2. Combined with the roughly 80 million gallons drawn annually from Duke Pond, nearly all of the plant’s needs will be met without drawing from Durham’s potable water supply. And unlike the pond, which can see its water production altered by weather, the WaterHub can produce consistently. “That source is always there for us,” said Myron Taschuk, the Duke Facilities Management project manager on the project. Once wastewater enters the WaterHub, treatment filters skim off solid material. Tanks with both oxygen-rich and oxygen-depleted environments allow specific microorganisms to break down contaminants. The water is then moved through root systems of plants grown in the WaterHub’s hydroponic greenhouse, which act as natural filters. After water is moved through a synthetic, microorganism-rich mesh, a series of fine filters and a disinfectant process, it emerges as clean – though non-potable – water. In addition to easing the strain on municipal treatment infrastructure and saving Duke money, the WaterHub will provide an opportunity for the Duke community to learn about greener methods for treating water with tours for students and the public.